If you have lost teeth, replacing them with dental implants sooner rather than later is highly advisable. Replacing your teeth will enable you to eat the foods you love, speak with ease, and smile with confidence. Here is another important consideration: If you don't replace your teeth, you will start to lose bone in your jaw. Why? Bone is a living tissue that needs constant stimulation to maintain its volume and density. That stimulation normally comes from the teeth; when they are lost, the bone that used to surround and support them starts to break down. Wearing removable dentures will accelerate this process. The longer you go without teeth, the greater the bone loss. If you have lost all of your natural teeth but have not yet experienced significant bone loss, you have a terrific option for full arch, permanent tooth replacement: implant-supported fixed bridgework. Implant-supported fixed bridgework is a lifelike upper and/or lower arch of false teeth that is virtually indistinguishable from natural teeth. It stays in your mouth all the time, unlike removable dentures. It is securely and comfortably anchored by several dental implants that become an integral part of your jawbone once inserted during a minor surgical procedure done in the dental office. 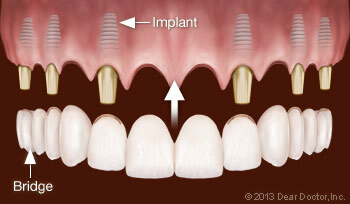 A dental implant is a small, screw-shaped post that serves as a replacement tooth root. Like a natural tooth root, it is housed in the bone beneath the gum. 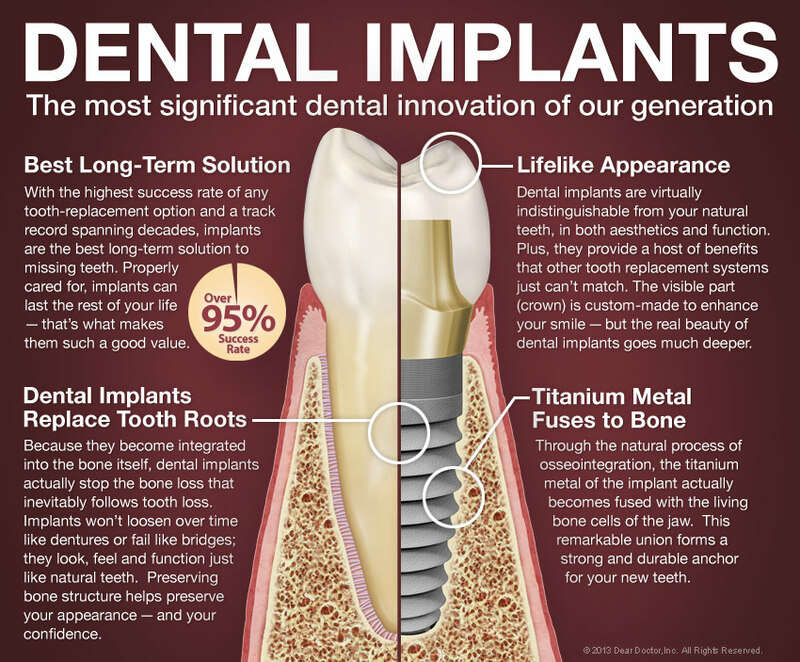 Implants are made of titanium, which has a unique ability to fuse to bone in a process called osseointegration. That's what makes them so sturdy and reliable. It's also what enables them to stabilize and stimulate your jawbone to maintain its volume and density — along with a more youthful facial appearance. 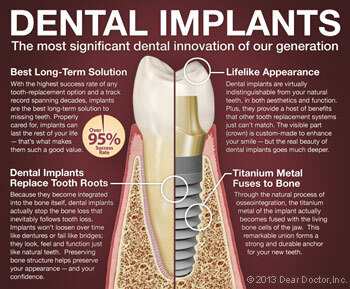 Today's state-of-the-art implant systems enable a minimum number of implants to support a maximum number of teeth. That means as few as four implants can be used to support a full arch (upper or lower jaw) of fixed, non-removable replacement teeth. What's more, it is sometimes possible to accomplish this remarkable, life-changing process in just one day! Implant-supported bridgework offers a more efficient and cost-effective strategy for permanent tooth replacement than using a single dental implant for every missing tooth, which is impractical and not generally recommended. Considering that there are usually 28 functional teeth (excluding wisdom teeth), placing a dental implant for each one would be prohibitively expensive and might not offer any better results than implant-supported fixed bridgework. Three-dimensional (3-D) x-rays of your jaw may be taken to pinpoint the location of anatomical structures such as bone, sinuses and nerves. This will enable us to determine how many implants you need and the ideal location for them. For each implant we will need to make a small channel in the bone. You will feel nothing during the implant-placement surgery, which usually requires only local anesthesia. We will discuss your individual anesthesia options with you beforehand and make sure you are comfortable. Once your implants are in place, we will either attach a temporary set of teeth, which stay in your mouth approximately three months until the implants are fully fused to your bone and healing is completed, or provide another temporary tooth-replacement option during healing. Because implant surgery is very precise and well-planned, people generally have little post-operative discomfort and begin functioning with their new temporary teeth almost immediately. However, it's a good idea to avoid crunchy, chewy or tough foods for at least six to eight weeks. When the process of osseointegration is complete, we attach permanent teeth that fit your healed gum tissues more precisely than the temporary ones did. With these teeth you can eat anything you want — and they will look as good as they feel! Your new teeth will require the same care as natural teeth: daily brushing and flossing, and regular checkups and professional cleanings. With conscientious oral hygiene, implant-supported fixed bridgework should last a lifetime.